Yea Ok. Bear in mind that her son Sgt Red has been deployed three times already. So we finally got the call that deployment would be Thursday at 10:00 am. So me and Corvette got on the road at 5:30 pm on Wednesday night.We drove and arrived in San Diego about 1:30 am on Thursday and promptly got lost. We called LCpl Honda who was waiting at our hotel and he GPS’s our location, found us and then came and got us. We finally got to the hotel and went to sleep at about 2:00 am. We then got up at 5:45, which was 4:45 our time and went to the base. LCpl Honda reported in and we went and ate breakfast. I did not feel to good at that point and just ordered toast. It was the worst toast I ever had. Hard, cold and yucky. I just drank some milk and called it good. 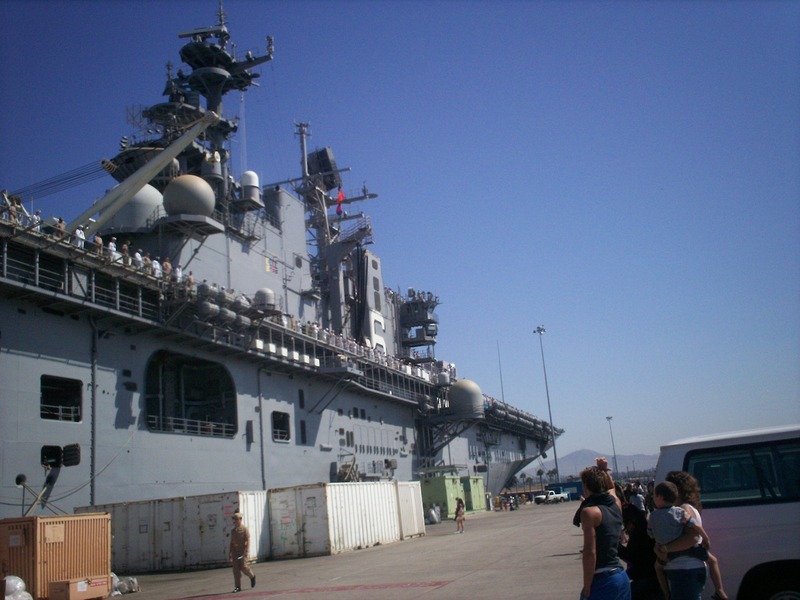 We then went outside and I thought that I would not be seeing LCpl Honda again as we had said our goodbyes before we went to the restuarant but he called and said we could tour the ship! Yea!!! 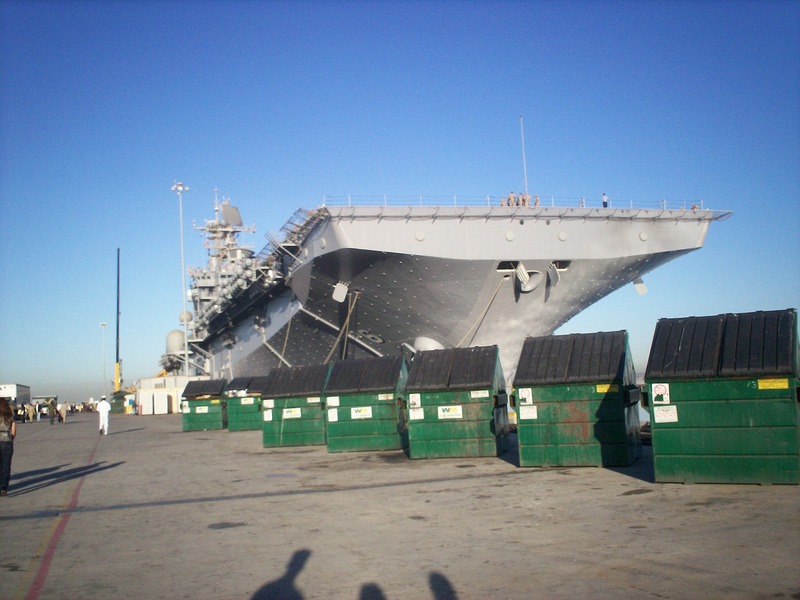 We then walked about 1/4 mile to get to the ship, stopping every so often so Corvette could rest. For those of you who don’t know, Corvette had polio as an infant and walks with a limp. We finally got to the ship and climbed three flights of stairs and got on the ship. I went with LCpl Honda to the chow hall, past the post office and almost to his barracks, but we thought better of that because I did not want to intrude on other Marine’s privacy. Next we went to the flight deck. That is where LCpl Honda works in Combat Cargo. Wow it is huge and impressive. After that Corvette and I left the ship and sat on the dock for about three hours while we where waiting for it to get underway. I walked the 1/4 mile 3 times to get water and such and because I was a little bored just sitting there. Basically I just watched so many families saying goodbye to each other. I saw wives, girlfriends and most importantly kids say goodbye to husbands, boyfriends, and daddies. Military families give up so much. Finally, the ship got underway. 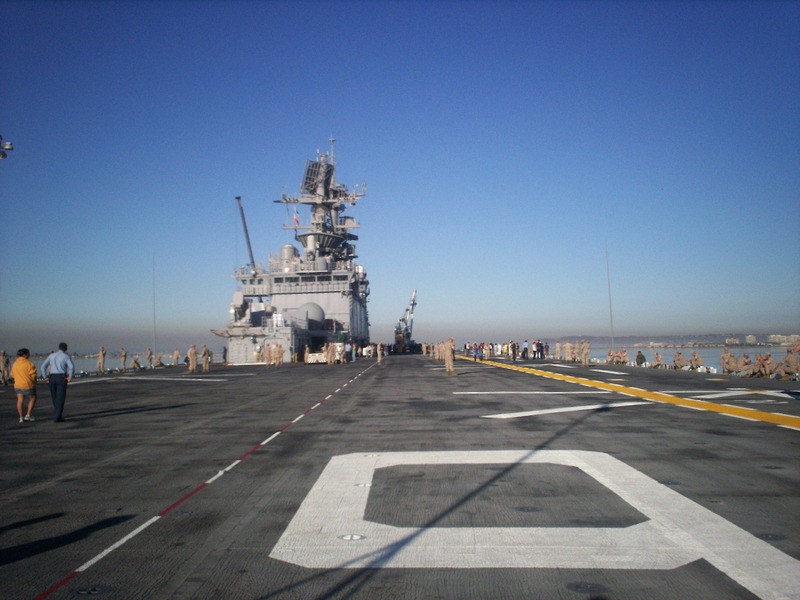 We watched the Sailors and Marines march out to line the flight deck. By this time, there was not a lot of people left on the dock. We all went to the end of the dock and watched as the tug boats slowly pushed the ship and turned the ship so it could leave the harbor. 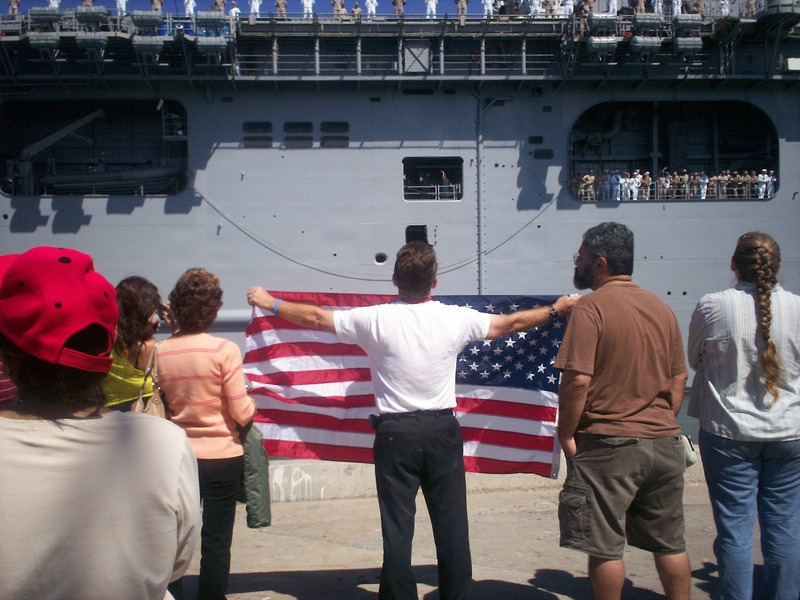 There was a man, a parent I think, who held an American flag out-stretched in his arms, toward the ship. He held it fast and strong until the ship was far away. I will never forget that moment. He made me proud to be an Amercian. There was not many people at the end of the dock, but I felt united with them. Like a family. Semper Fi. I was so glad I was there. Here is a professional pic of the ship, underway. 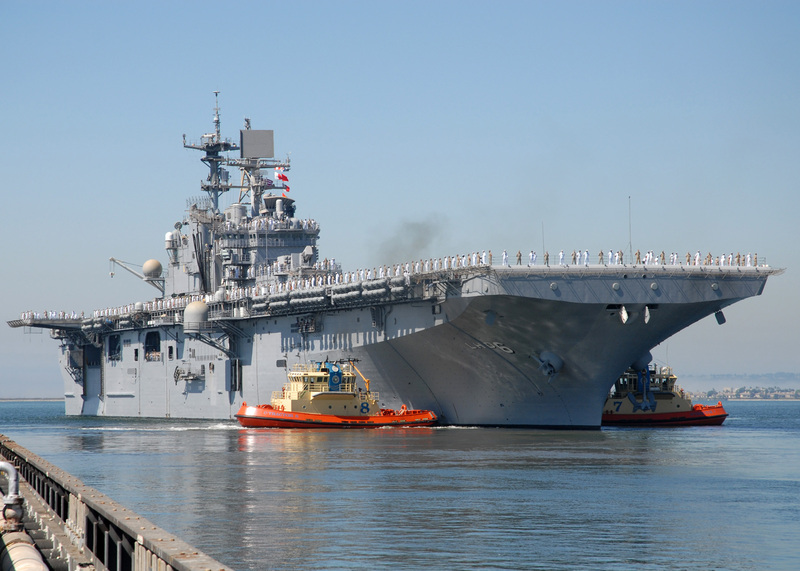 Please pray the 11th MEU has a wonderful adventue and comes home safe!